At this year’s EMEA Personalization Summit we rewarded RichRelevance customers who are leading the way in personalization through data science, testing and innovation. One of the most prestigious awards was for Personalization Innovator of the Year, which recognized the retailer who has demonstrated the most forward thinking initiatives and differentiated, innovative ideas in personalization that drove key performance indicators for the business. Verkkokauppa.com, Finland’s largest, most known and most visited online multi-category retailer was named the winner of this award. Verkkokauppa.com is not afraid to think outside the box and be different. We have continuously been blown away by some of the leading-edge innovations they have introduced into the customer experience on Verkkokauppa.com. A pioneering 404 page displays available and in-stock alternative personalized products when a shopper searches for an out of stock or discontinued item. Verkkokauppa.com uses personalized product recommendations and displays them like building blocks to spell out the “404” in the hero image on the page. The is an exceptionally unique, creative and eye catching way to make the shoppers’ experience fun and different. 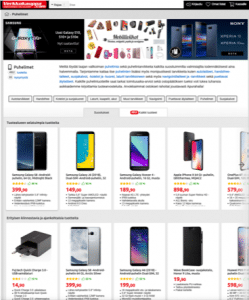 Verkkokauppa.com has improved the Search results page by integrating personalized recommendations that offer a more dynamic and diverse assortment in the results set. Improving the relevancy and experience for customers beyond simply offering a long list of search results. 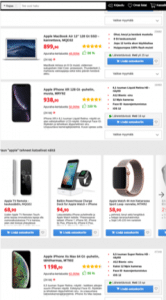 On category pages Verkkokauppa.com lists personalized placements at the top of the page instead of just listing all products, as a way to improve the shopper experience and help shoppers discover what’s most relevant to them within a category. By giving customers relevant suggestions, Verkkokauppa.com avoids overwhelming customers with too much choice (sometimes 1000’s of alternatives). Congratulations to the team at Verkkokauppa.com for winning this accolade, very well deserved! We’re excited about continuing to innovate your customer experience together!